The Cats Meow Loft: Cats love to climb up to high spots so they can view their surroundings. Not only does this entertain, it also makes them feel safe. They enjoy high perches so they can look over the area, or as any cat owner knows: "Reside over their kingdom from on high!". This is a terrific addition to any kit size except the FelineFlat and our Tower of Meows enclosures! The loft provides room for your cats to lay around, sleep, play and watch the world go by! The loft includes flooring with access opening, plus our extendable ramp. Litter Module w/ NO Access Door: The Litter Module is a cube designed to keep the litter mess out of the enclosure. This package requires access from inside the enclosure to change litter. 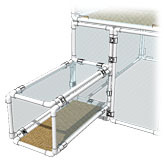 Litter Module w/ Access Door: This is a nice addition to keep litter separate from the enclosure living area. This package provides the convenience of external access for cleaning litter. Need Attachment to Pet Door? Pet Door Panel and (if required - tunnel attachments): For access from a pet door into the enclosure. Check it out - click the green button! Twelve Inch Height Extender: Increase the height of the enclosure from the standard 62 inches to 74 inches. Order as many as there are panels around the sides of your enclosure. Includes clamps and hardware. Extra Panels: Get Creative! With extra panels you can extend your kit by height, depth, and width. 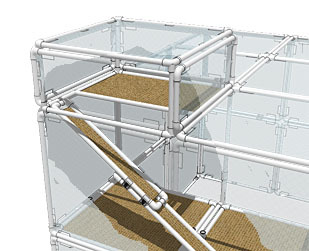 Create your own enclosure configuration at anytime! Each panel includes 4 clamps! Ramp: A great way for your cats to climb onto the kits full shelves! They slide to 50 inches and have machine washable carpet attached. Easily clamps to the lip of the enclosure shelf. Full Shelf Kit: Comes with support frame. and machine washable carpet. Ideal for adding territory to your enclosure. Tower of Meows Ramp: A ramp for very young kittens or older cats to migrate bewteen levels in our towers. They are 24 inches and have machine washable carpet attached. Easily clamp to the lip of each tower level. Half Shelf /Step Bench: Add even MORE territory. Easily slides into the sockets on a full shelf or used as a bench on floor. Comes w/ machine washable carpet. Access Door: In the event you wish to have human access into other areas of your CatsOnDeck enclosure configuration. Full Bench Kit: Comes with legs. and machine washable carpet. Ideal for adding territory to your enclosure - especially the LowBoy kit. Extra Full Shelf Carpet: Machine washable carpet. Extra Half Shelf Carpet: Machine washable carpet. Extendable Ramp Carpet: Machine washable carpet. TWO carpets per purchase. Tunnel carpet: These are all custom made. 6 and 8 inch tunnels receive TWO. All others are one carpet. You will be contacted regarding order on size, etc., before shipment.